This is a sponsored conversation on behalf of Produce for Kids. All opinions are, as always, 100% my own. Being a mom, I hope that I am successful in passing down my passions. My passionate distaste for folding laundry can stop with me, but when my kiddos get interested in cooking and photography, it flat out lights me up. They both love taking pictures on their iPods and getting into the kitchen whenever they can. I can’t make a piece of toast without them wanting to be completely involved with the whole process. Yesterday, I walked into the kitchen to find that C had gotten out a brick of Swiss cheese, a box grater, a summer sausage, a butter knife, a clementine and a large pomegranate. She helps me in the kitchen enough to know what she’s allowed to use and what’s off limits. I asked her if she needed help with anything and she told me that, no, she had it all under control. Well, all except for the pomegranate. She held it up and informed me she didn’t know how to ‘open’ it. I showed her how to score the skin, hold it under water and gently release the seeds before allowing her to deseed the fruit all by herself. It was such a small thing, but I was so proud of her. She’s independent and spunky and just willing to try new things. It made me feel like I was doing something right – setting a good example for her. Because the older the kids get, the more obvious it is that they look to my husband and I for cues on how to behave and act. Healthy foods and activity is no exception. I make a very conscious effort to have healthy fruits and vegetables present at each meal, whether it’s an on the go breakfast, snack, lunch or dinner. Certain times of the year that’s harder than others. With the holidays coming up, it can be so easy to slip into unhealthy habits and indulge too often and eat healthy too infrequently. Sure, it’s a time to enjoy cookies and pies and comforting treats, but I’m making a huge push this year to not forget about the good stuff, too. The salads, roasted veggies and seasonal fruits. 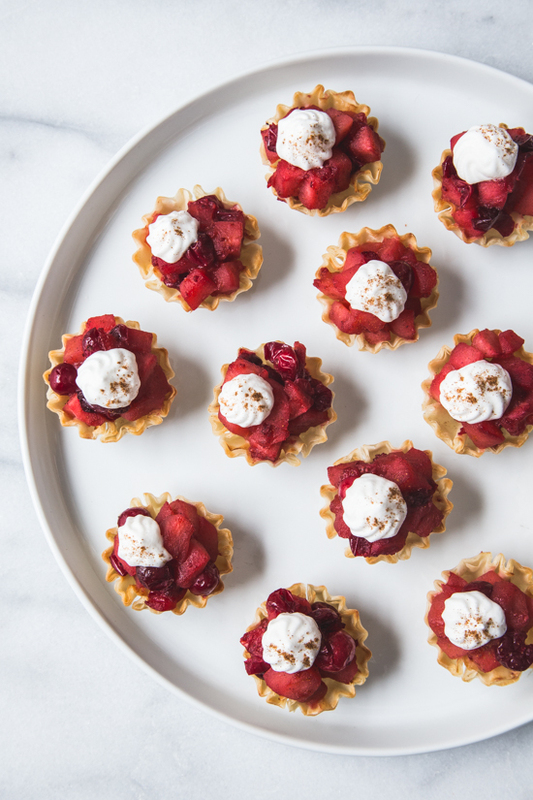 These mini cranberry apple tarts were born out of a desire to take the flavors of my grandma’s cranberry relish and spin it into a lighter, poppable dessert. Tart granny smith apples and fresh cranberries are sautéed with cinnamon, orange juice and a touch of maple syrup. The results are sweet and tart and so reminiscent of my favorite Thanksgiving flavors. This month, Produce for Kids came out with a wonderful free eCookbook called Festive Flavors. It’s got wonderful, fresh takes on classic Thanksgiving dishes that are lightened up for healthier eating this holiday season. And because it’s Produce for Kids, all 12 recipes are incredibly kid friendly. Head over to the Produce for Kids website and download your own copy of Festive Flavors to help inspire you to eat a little bit healthier this holiday season. And be sure to give these mini cranberry apple tarts a try! 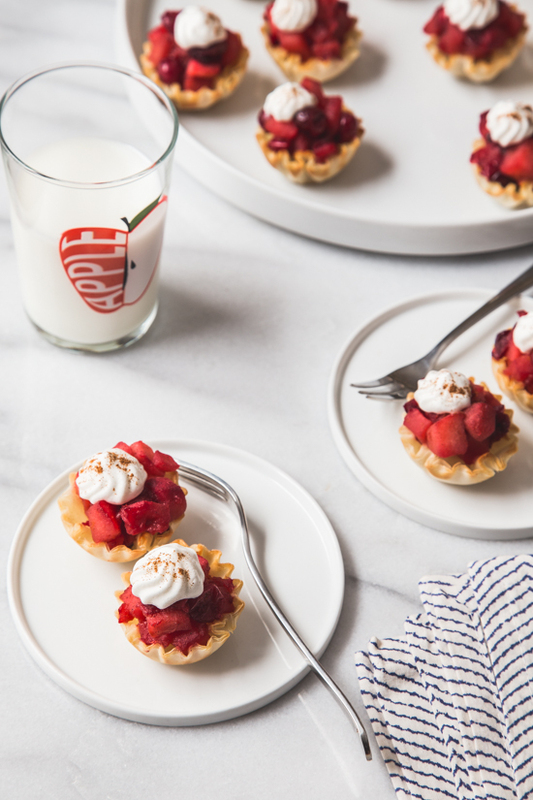 They are simple, sweet, tart and the perfect little bite for your Thanksgiving dessert table. If you’re looking for a great fall snack, be sure to check out my Caramel Apple Rings – fast, simple and kid friendly. Heat oil in a large non-stick skillet. Add apples, cranberries, orange zest and juice and cook, stirring often, until apples begin to soften and cranberries start to pop. Add maple syrup, water and cinnamon and simmer for about 2-3 minutes. Place tart shells on rimmed baking sheet. Fill with mixture and bake for 10 minutes or until shells are crispy and mixture is heated through. The apple cranberry filling can be made the day ahead of time and refrigerated. Before serving, fill and bake tart shells as directed. I don’t think I knew what a pomegranate was until my early twenties! Your daughter is way ahead of the game. These look like a yummy light dessert. Can’t wait to try it. These tarts look too cute to eat! Also, just discovered your blog – great blog name, haha! Ha, Thanks so much, Jessica! I am smiling ear to ear with this post. 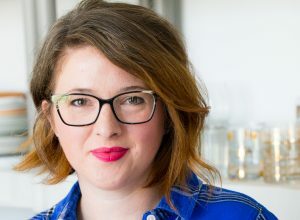 Of course your kids are drawn to you in the kitchen. You are so passionate and happy about food, they want to be just like you 🙂 Maybe it’s so obvious as an outsider, but I’m not surprised your kids gravitate towards the things that you’re good at and the things that make you happy. Aw, thank you Christina! It is a really humbling thing to see my kids wanting to be like me and my husband. It makes the responsibility of being a good example so apparent. I just hope that I can be that good example that they need, and in the (many) times that I’m not, I can help them to learn from my mistakes. Thanks for stopping by, my friend! Oh my goodness, I can totally see C breaking out the box grater! She is too darn cute. 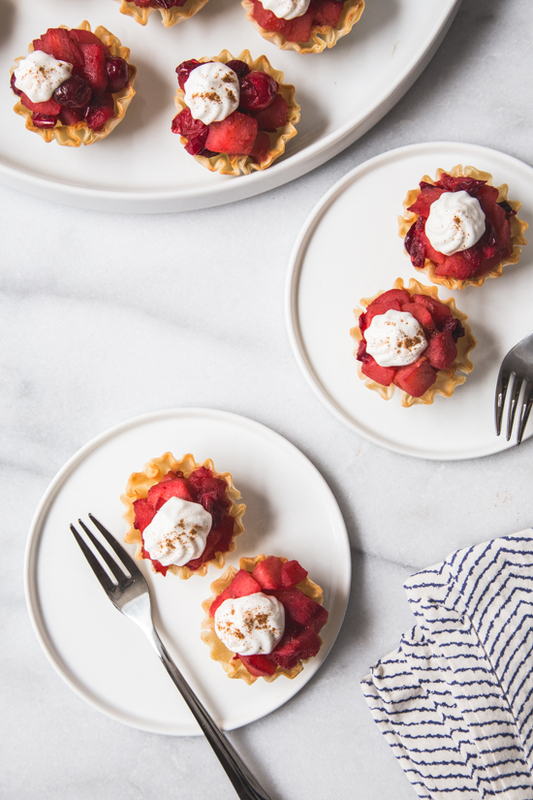 I love these cute little tarts – so perfect for the holidays. These are just so cute and lovely!! I want to pop one (or twelve)! 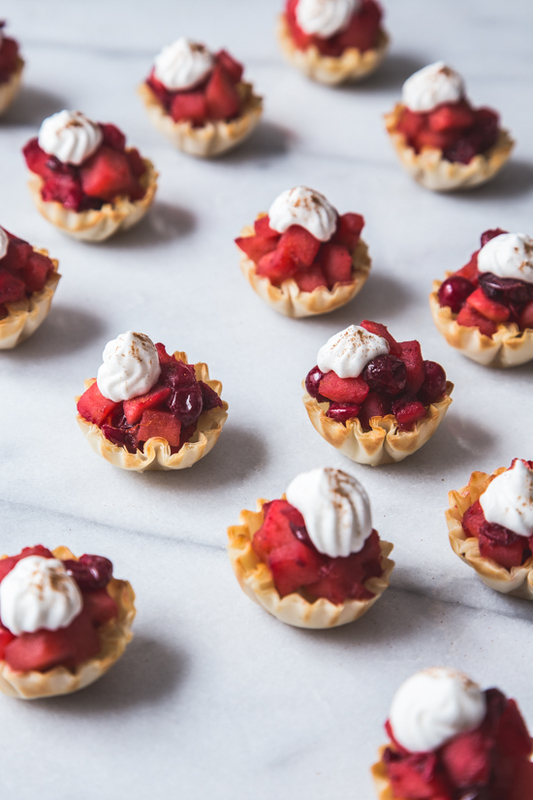 I’ve been loving the combination of cranberry with apple lately – these mini tarts are too cute!